Air Force Colonel Alfred R. Novak, 76, an Air Force Colonel and pilot who retired in 1969 as liaison officer to the Air Force Chief of Staff, died of a heart attack Feb. 16 at Inova Mount Vernon Hospital. He lived in Alexandria, Virginia. 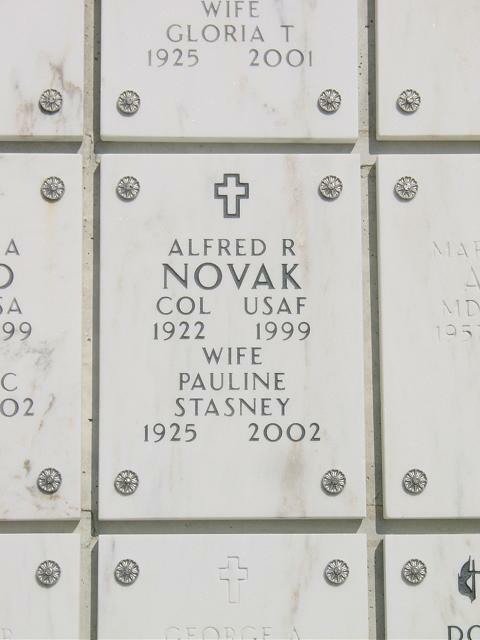 Colonel Novak was a native of Danbury, Connecticut, and a graduate of the University of Nebraska. He also attended the Armed Forces Staff College, the Air Command Staff College and the International University of Metaphysics. Colonel Novak served in Europe and North Africa during World War II and flew 92 missions as a bomber pilot and navigator. He also served in Korea during the Korean War. After he retired, he was Senior Vice President of First Virginia Bank, where he worked for 15 years. His honors included seven Air Medals, three Air Force Commendation Medals and a Distinguished Flying Cross. He was a past master of a Masonic lodge in Alexandria and a member of the Scottish Rite and the Knights Templar. Survivors include his wife of 53 years, Pauline Novak of Alexandria; two children, Barbara Clark of Springfield and Mark Novak of Purcellville; and four grandchildren.